This tree is located in the southwest corner of Library Lawn. It is on the south side of the sidewalk that leads from the Math building entrance to the Central Library. 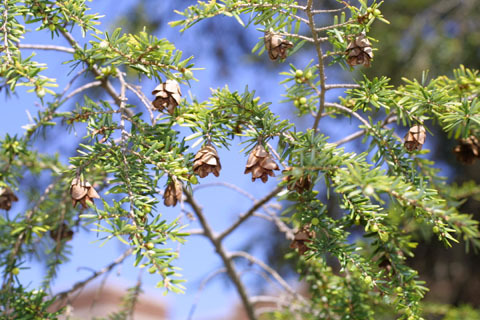 Eastern hemlock has short, flat needles that are arranged more or less in two rows along the twig. The lower surface of the needles have two white rows of stomata. Hemlock cones are small and woody. Both sexes of cones are found on the same tree. Hemlocks do not occur naturally in middle Tennessee. But they are an important component of the forests of east Tennessee and can be the dominant species in valleys in the Smoky Mountains. The hemlock wooly adelgid, an insect pest, has recently invaded the Appalachian Mountains and threatens this majestic tree species with destruction. This rather sad, leaning tree is all that was left after its main trunk fell over in about 2012. This organism is a living specimen that is part of the  Vanderbilt University Arboretum  with the local identifier 2-978.